Wall Street analyst Brian Wieser has refined his estimate for U.S. ad growth this year, projecting that 2017 will expand 4.4%. 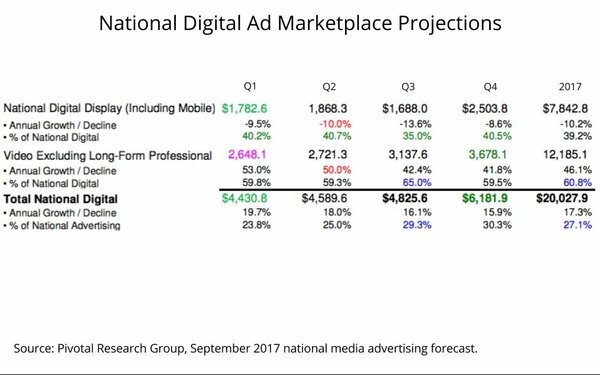 The revision is still in the “4% to 5%” expansion range Wieser published in “key challenges” for digital and advertising, which represent the bulk of the marketplace. “Advertising is facing challenges on many fronts, especially within the two largest media, digital and television,” Wieser explains, noting the Big 2 media categories are suffering votes of confidence from marketers for different reasons. “Digital advertising is having a moment, and not a good one,” Wieser explains. “Beyond ad quality issues, we have concerns that marketers will concern themselves more with the basic trustworthiness of media owners and the capacity to use personal data going forward, as well as the underlying effectiveness of digital media more generally. "Ad quality issues of viewability, brand safety, fraud and bots are problematic, of course, but ultimately seem relatively manageable for marketers vs. the latter group of problems. “Facebook’s recently publicized issues around mismatches between audience data provided for planning purposes vs. data from global census bureaus and its initial inability to find ads from Russian propagandists follow on several other incidents over the past year, all of which compromise claims Facebook makes to marketers. Wieser’s report goes on to cite concerns of marketers ranging from Procter & Gamble to Uber to Restoration Hardware.